Inquire for more details on the exact location of the tree tent. 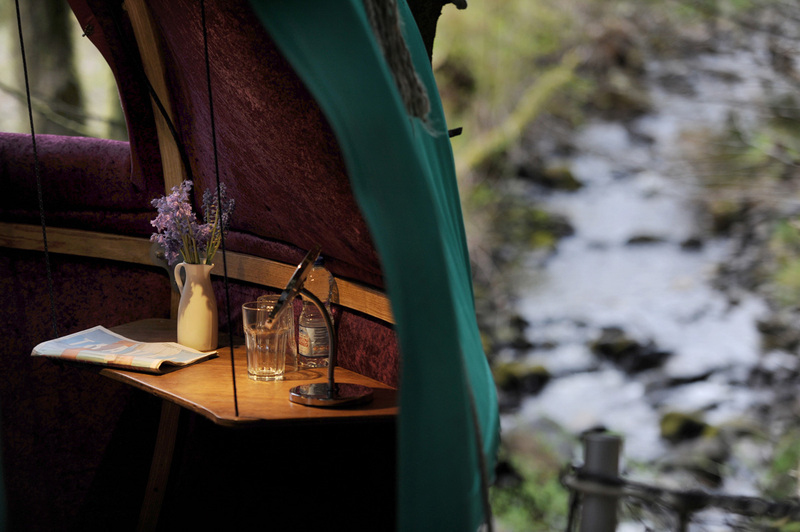 Have a unique luxury glamping experience in Wales at Red Kite Tree Tent. The UK’s first tree tent is an exciting place to stay for those young at heart and seeking experience and adventure. Its clever design has caught the eye of many designers and was featured in George Clarke’s Amazing Spaces. The Tree Tent is a lightweight, hybrid aluminum and "steam bent, green ash" static airframe. Sounds complex, but the important thing is it’s beautiful inside and out. The design of the tree tent enables you to live close to nature, within it almost. As the tent is approached across a private bridge over a stream, the 3 meter spherical tent comes into view, held in the trees by an ingenious rigging system. The clever interior design comfortably accommodates two adults (if you have children, we recommend you book Red Kite Barn alongside the Tree Tent for a family escape) and even a log-burning stove, so with thick thermal liners, you can have a cosy glamping experience. The double bed, with the potential for an amazing view from the side window, folds away to make a sofa for use during the day or evening. There is solar electric power to the Tree Tent, so lighting is electric and dimmable no less! There is even a power socket for gadgets and plenty of storage space. Leaving the bubble, your outside facilities include a gas camping stove and a sink with running water for cooking. Refresh under the hot water shower cubicle on the decking outside the tent. There is a private WC in a little wooden cabin a short walk away in the woods and a fire pit and BBQ grill down by the stream. The property has a three-night minimum stay; $566 total for three nights.